Could be one of those crazy, hot, over-crowded nights at fabulous O’Leaver’s tonight. Everyone’s in town for the holidays looking for a rock show, and the only one on the radar is Rusty Lord and Alcools at The Club. Just a reminder, “Rusty Lord” is, in fact, the weather guy at Channel 6. Unfortunately, he’s not in any way associated with this band (though he should be. Think how it would impact his Q-Rating). 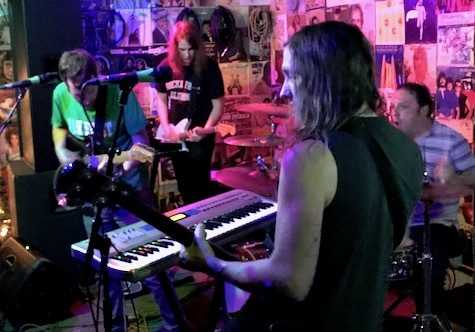 Instead, Rusty Lord is a local garage rock super group with Pro-Magnum’s Johnny Vredenburg and Austin Ulmer, Ben VanHoolandt of Digital Leather and the Omaha rock ‘n’ roll madman/genius/legend Dave Goldberg behind a full drum kit. Their sound has been compared to Ministry, I think they’re more metal than that. Find out for yourself tonight at 10. Opening is Alcools (ex-Dead Flower Preservation Society). $5. This is the one where the real Rusty Lord makes an appearance and even introduces the band. The outcome would be jubilant chaos. Tomorrow night (Saturday) you have choices. A very interesting show came out out nowhere: Karger Traum at Pet Shop Gallery (former Sweatshop space). We’re talking industrial rock/dance music sung in German by a couple dudes from Oklahoma City. Influences include Einstürzende Neubauten, Deutsch Amerikanische Freundschaft and Suicide.Their latest, Such a Dream, was released in October on DKA Records. This is a stacked bill, with Cultplay, Ruby Block and CBN. $5, 10 p.m.
Also tomorrow night (Saturday), Matt Whipkey and his band play at O’Leaver’s. Expect to hear songs off his forthcoming album, Driver. Raquel Telfer and The Shineys open. $7, 9:30 p.m. Meanwhile, way out at Growler USA, Scott Severin plays with Josh Rector. Free! and 9 p.m.
And Satchel Grande returns to The Slowdown Saturday night with Andrew Bailie. $8, 9 p.m. While I’m thinking about it (and because who knows when I’ll next update this blog), ex-Omahan (But does anyone ever really leave Omaha?) Jake Bellows (from Neva Dinova fame) plays at Slowdown Jr. with Whispertown. They’ve got a new album out, I’m A Man (2017, Graveface). This one could be special $6 Adv/$8 DOS. If I don’t get back to you before then, have a Merry Christmas/Hanukkah/Festivus.